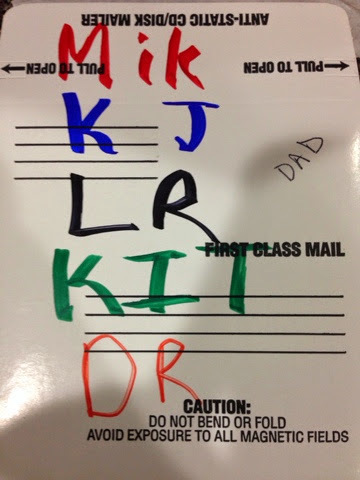 Dad decided to "help" with my packing system by adding his name in pen to my labeling key. He then told me if I found any of his stuff put it in a box and label it DAD in pen. Just because I unpacked the boxes in his office finally, doesn't mean I'm packing his stuff, especially since he is definitely going to be the last one to move. Don't get any ideas Mom! This past week I was going to begin packing for our move to Virginia in a few weeks, but first I decided I should actually unpack everything from when we moved to Alabama a year and a half ago. The only boxes left unopened were the ones in Dad's office, which I finally noticed was actually mostly stuff from where Mik and I were living and not our parent's house, so I it was actually very little Dad's. It was a lot of Mom's and junk that went straight to the trash or recycling, but I also finally found my postage scales. There were also four or five boxes actually Dad's, which I did not unpacked, but they have at least been opened and confirmed to be mostly his to deal with. Last night I told Dad there was only one box left for me to go through and it was too heavy for me to move to my room. He asked if I had found the 1999 photos I have been trying to locate and I said no and they were not likely in that last box. That was when he reminded me we have an attic. That would be exactly where they would have ended up, too. For now, though, that is mostly storage or get rid of (decorations mainly), so not going to deal with that until after we move the useful things to Virginia (and get Mom clear a path in her "office" to allow the attic stairs to come down). 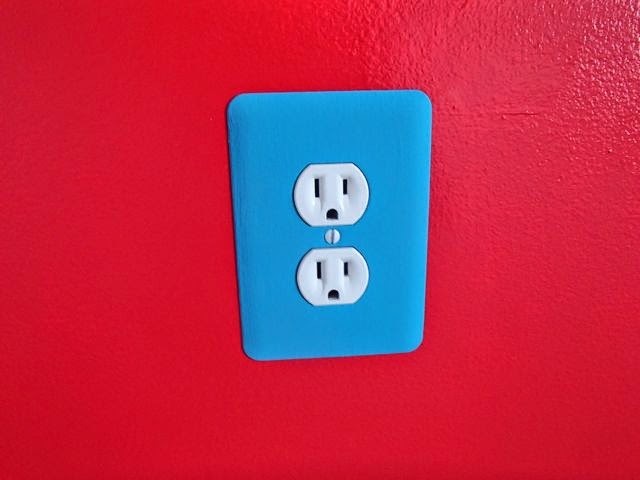 Back in 2012 I painted the outlet and switch plates for Mik and my rooms in our house in Arizona. I meant to eventually do the whole house, but then we moved to Alabama. Again, I planned to do them in that whole house, but that got forgotten and the only special ones there are the farm brand and heart shaped ones I had before the move. When I mentioned to Mik that I was going to paint mine blue and that we should paint/decorate all the ones throughout our new condo, he at first did not know what I was talking about. As soon as I reminded him about how I had painted them in his room back in Tucson, he got very excited about the idea. I even suggested I try to get fancy and do sports themed ones for our living room, which is going to be sports themed with mostly the All the Ballparks souvenirs and other baseball stuff. We agreed that my efforts at the fancier ones may stink, but we could just buy new plates or get some on Etsy or something if they ended up looking bad. However, I think they turned out pretty awesome, although there's a chance he will veto keeping one of them. Currently, I have finished all the ones in the bedrooms and the bathrooms and about half of the ones in the living room/entry. The other ones in the living room may just end up being concealed by furniture, but I only did not do anything because I ran out of ideas for now. The kitchen and dining room also need to be done. No ideas for them at the moment other than leaning towards more creative like the living room ones and they will be Disney themed as that's the theme we have chosen for that part of the condo. I've had a penguin bathroom theme in most places since my first house after college including the bathroom I shared with Mom and Dad in Huntsville having my penguin shower curtain. 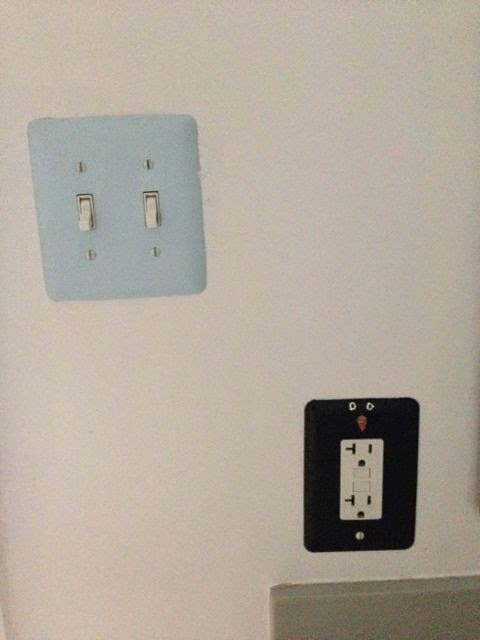 I painted the light switch plate to be like an iceberg and the outlet cover to be a penguin. Mik's bathroom already had a purple wall and we decided to keep it because in Alabama he has a painting with purples that he currently has in his bathroom because it does not go with the colors of his art collection in his room. Also, purple is one of the Lakers colors. He did not actually decide on what to do for the bathroom, but I think he'll like what I chose. If not, I'll change them. Mik did choose his colors for his room. He has one red wall and he choose a turquoise for the covers on that wall. I think this combination turned out very awesome. Might even have to rethink putting his entertainment center on that wall because that would cover up the outlets and they just look so good. The rest of the covers in his room are red like the red wall. This one, though, is in the hallway entry to his room and I added a coat of glow-in-the-dark paint. It does not really glow because I only put one coat on and I wasn't sure he would like how it changed the color. Might end up adding more coats so it really glows or just make it red like the rest depending on what Mik wants. I bought a pack of MLB collector's stickers that are random ones like trading card packs to see what I would get that I could maybe use to make some fun switchplates for the living room. I ended up with a Nolan Ryan, which fits the theme with him being one of Mik's favorite pitchers of all time and the Nolan Ryan Exhibit Center being one of the places we went on the Ballpark Trip. 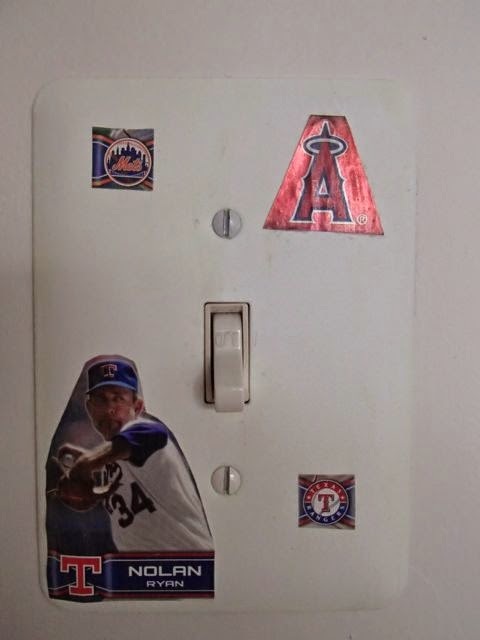 I also ended up with an Angels sticker as well as a Mets player and a Rangers player that I cut the team logos from. If only, I had gotten an Astros player, then I could have had logos for all the teams he played for. 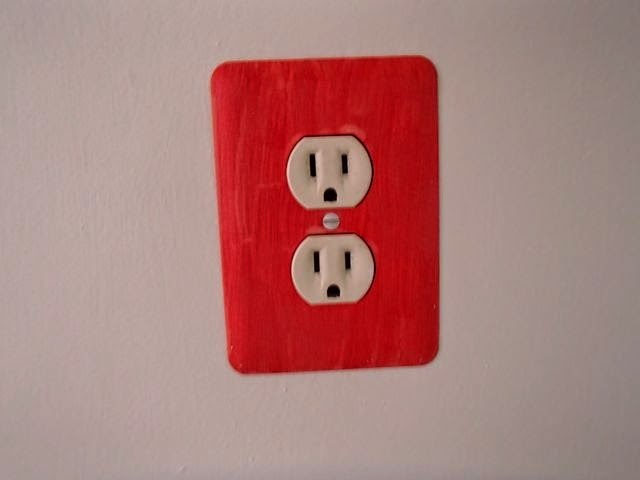 I painted it over it all with Glow-in-the-Dark paint. 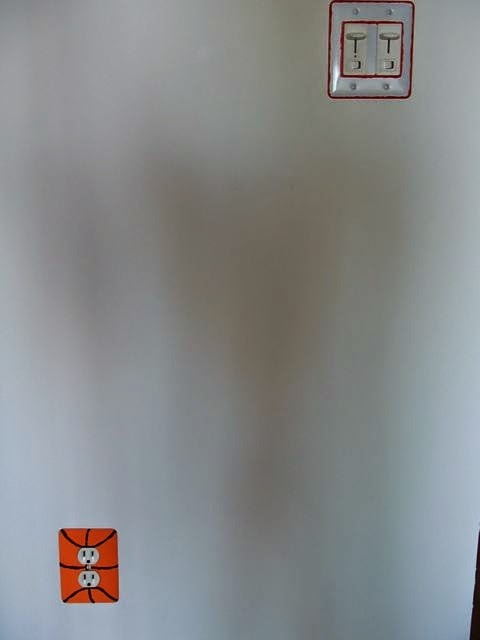 This one has enough coats that it can glow, but it is in a spot that doesn't have a nearby light, so it doesn't really get charged up. 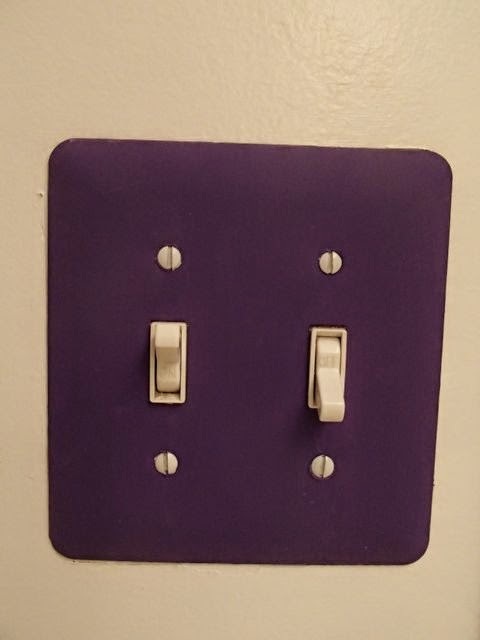 Since Mik is big into basketball, I painted one outlet cover like a basketball and the light switch plate on that wall is supposed to resemble a backboard. The basketball came out good, but I don't know if the backboard will make sense without explaining. 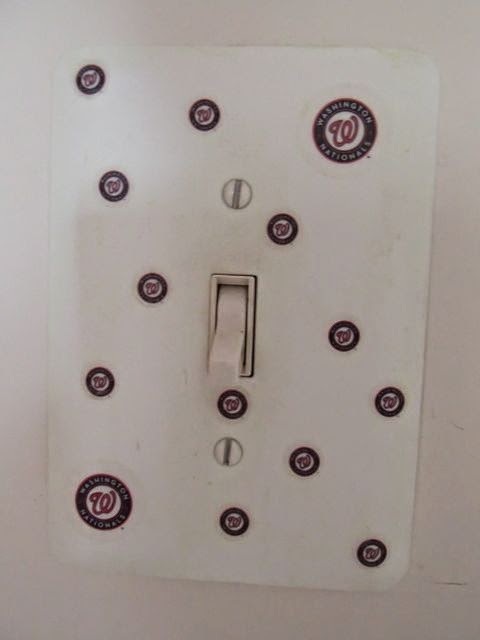 I made a Washington Nationals light switch plate using some nail art stickers Mom found when we were out buying paint. This one is also painted with glow paint and it is in the entryway with a light above it, so it does end up glowing. This is the one Mik might end up not agreeing to keeping, but I am hoping it won't be hard to sway him to allowing it to stay because I did make him a Nolan Ryan one and a basketball one. Plus, there are still covers to do in the entryway and if I can just find something that works I will make one Dbacks themed. We did not want to move any furniture on our initial trip to our condo to allow for easy painting and installing new flooring in the bedrooms. Since we did not have to do anything to the patio, I did bring most of our collection of Disney Yard decorations. Only things I did not bring were the grumpy plant (not going to be here to water the dill in it, so left in Alabama for now) and the lighthouse (I thought it might be too big, but it will go great in the corner I took the above panorama from). I also brought some of the penguin army, which Mik says I cannot have on the patio except as a seasonal decoration, but for now he is not here and I have six on the patio (Christmas in July is coming up, right?). The ones I took were the extra sitting on the porch since we took them out of the yard after Christmas and the rest Dad would not let me take because they look good in front of the fake garage door in Huntsville. Eventually I will move them all here and I will probably have to keep them in the storage unit except for December. Maybe, Mik will let me have one out all year round, though. A light? No, a Hat Rack! The past few days I kept trying to find a place to hang my hat. I am used to having knobs to put them when I am at home. I have three racks, but I did not think of bringing one of them as one of the few things we brought for our initial trip to our condo. I have been mainly leaving a cap on the kitchen counter by one of the doors to the patio, but I was getting tired of it taking up counter space. In looking for where I could instead hang it, I noticed that in the corner where it's designed for a table to go the light fixture was a perfect location for a hat. It is a little low, but we plan to fix that eventually anyways because we are not going to put a table there. It is actually a perfect hat rack at least for now because it has room for 4 hats and that is how many I brought with. Since the kitchen is going to be Disney, I think I will continue to use it as a hat rack and only have Disney caps on it. For now, though, it's got two Nats caps and two Disney caps.